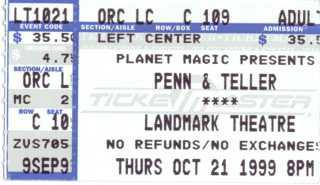 I just got back from Penn & Teller's touring magic show. These "bad boys of magic" put on a pretty entertaining show, ranging from cheesy card tricks to moving illusion-enhanced stories to death-defying stunts. The last one was a double bullet catch: they fire .357 caliber handguns at each other and catch both bullets in their teeth. The stage starts divided by a yellow line, Penn and Teller on either side and never crossing the line. As Teller never speaks, Penn asks the audience if anyone is familiar with firearms, being a soldier, cop, target shooter, etc. On this night, a corrections officer and yours truly (!) were picked to inspect the gear ("How do you know about guns?" "Trained at Gunsite and Lethal Force Institute!" "Excellent!"). Going to opposite halves of the stage, we examined the Python .357 revolvers (looked perfectly normal and showed wear of age and use) with attached laser sights, selected one round each from a container, marked the bullets with our initials and shells with made-up symbols (mine a triangle with a dot in the center), checked glass panes, and generally verified that the props were real. I was convinced! Penn proceeded to recite Cooper's Four Rules to the audience, emphasizing gun safety...which they then violated most blatantly (at least they told a thousand people what the rules are). Moving off stage, we watched as the goofy duo donned bulletproof vests & helmets & goggles. They turned on the laser sights, aimed thru the two panes of glass at each other's mouths, and fired simultaniously. 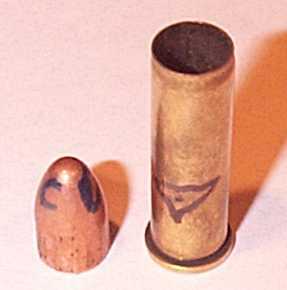 We returned to the stage, noting the bullets in the magicians' teeth, took the bullets (hmm...dubious honor of having Penn Jillette spit a bullet into my hand), verified the initials, verified the post-firing rifling marks and powder residue, then took the matching spent shell from the appropriate revolver on the opposite side of the stage, sniffed the shell's strong distinctive scent of gun smoke, noted the special markings, and checked the distinctive shatter pattern on the glass panes. I've studied guns, and I've studied magic. Beats me how they fired simultaniously and undeniably caught the other shooter's bullet in their teeth! Unique markings, evidence of firing, broken glass, short time, uncrossed dividing line...an excellent illusion well performed! It was a real trip to be picked to go on stage with Penn & Teller to verify their coolest trick, and to prove (at least to a couple people) that the volunteers from the audience are legitimate. Thanks guys!